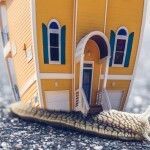 Yet another gloomy set of figures has just been released highlighting the woes that beset bricks-and-mortar retailers. It confirms our view that investors need to be cautious about retail stocks and, by extension, their landlords. One early indication of retail spending and something that is much easier to measure than actual spending as you do not need to gather data from all retailers is foot traffic. ShopperTrak is one of the companies that tracks how shoppers visit and move in shopping centres, and their data can give a good view of the overall trends before we see the actual sales reported by retailers. The Christmas period is very important for retailers as it represents a big portion of their annual sales. 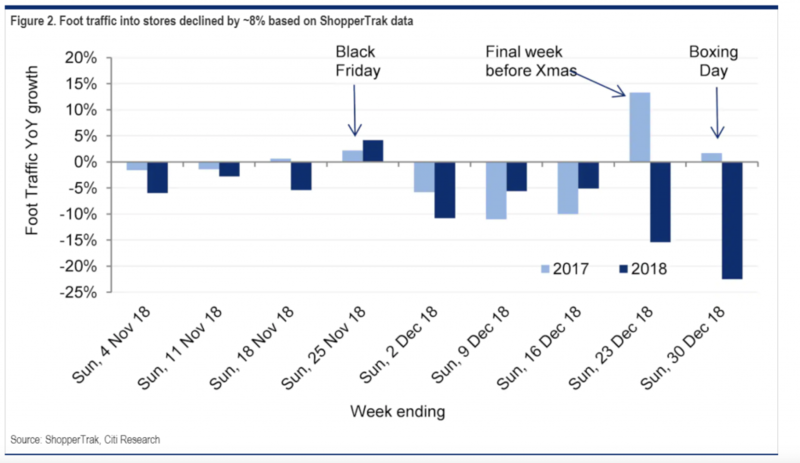 The saying is that retailers are often loss making apart from the first three weeks of December as those weeks account for more than the annual profit. A couple of weeks ago, Citigroup published a note showing what happened up until the end of December and the picture is not very pretty! Shoppers did their spending earlier than last year. This is definitely possible but the data above does not indicate this to be the case unless shoppers spent their Christmas present money in September or October and I find this hard to believe. The above data only shows foot traffic and not how much money each shopper is spending. If the average shopper were to spend significantly more than last year, it would compensate; but I struggle to see individual shoppers spending much more per person given that salary inflation is very limited in Australia at the moment. It is possible that we are seeing the effects on online retailing and I indeed suspect that a large part of what we are seeing comes from this. The problem is that Australian companies are generally losing from this trend with traditional physical retailers losing market share to online only operators like Amazon and Kogan (Kogan did indeed have a very positive trading update on 17 January with 32 per cent YoY growth in active customers and close to 10 per cent growth in revenues in 1H19). Unless we have seen a clear change in trends, traditional retailers are unlikely to have offset declining foot traffic by increased online sales. All other explanations point to deteriorating trading for traditional retailers and, by extension, for their landlords. On 23 January the Australian Financial Review published an article (paywall may apply) showing that the trends are continuing in January with foot traffic in the first two weeks being down about 3 per cent compared to the same period in 2018 (and it is worth noting that the first 2 weeks in January 2018 were down 10.7 per cent on the same period in January 2017 so it is not a very strong number per se). At Montgomery, we are not exposed to Australian retail companies or their landlords and nothing we see in the economic data so far indicates that we will change our minds. This is a follow-up to a couple of blog posts that I wrote before Christmas (this one looking at the increasing rate of retail failures and this one looking at the outlook for discretionary spending).